If you are unsure whether you get your magazines directly from Unique Magazines or the publisher, the easiest way to check is by looking at the address label on your magazine. If it has the Unique Magazines logo in the top left, then you get your magazines from us. If you are still unsure where your magazines come from, then follow the instructions for "I receive my magazines from the publisher" and we can match up your renewal. 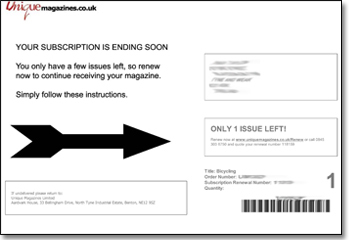 When your magazine is coming close to renewal, your address labels will look like the image on the left. This address label give you simple instructions on how to renew your order. This is a very simple process, and you can complete it in a couple of minutes. You will receive this notification on your last 3 issues, so plenty of time to renew your subscription. The checkout specifically asks you "Is this a renewal?". Click "YES" and proceed and pay as normal. You have now placed your order, and instructed us that it is a renewal. The publisher will then match up your current subscription, and your renewal, and join them up so that your renewal will start as soon as your current subscription ends. If you have any questions, please contact us on our main number 0345 303 6750.